Aloe vera is a naturally hydrating plant. When we think of aloe we often think about applying it to our skin to help with a sunburn or to help with dry skin. But the benefits can work from the inside out as well. Our digestive track is like one long tube from the entry to the exit so nourishing our bodies from the inside out is equally important. Get yo greens! This has been my go to spring smoothie except I forgot cucumbers at the store yesterday - definitely tastes better with lots of 🥒🥒 Pro smoothie tip: add fresh ginger to your fruit smoothies for an extra kick and to help digestion and reduce inflammation! Up your smoothie game this summer! Enjoy this healthy and fresh piña colada with or without rum. It's the perfect blend of sweet and refreshing! Blend all ingredients until smooth and add nutmeg on top as garnish. Oh man! My husband made this for me this morning and let's just say his smoothie game is on point. Carrot juice is a nutritional powerhouse! Loaded with beta carotene and vitamin A, carrot juice is a great source of antioxidants, and is also thought to cleanse and restore the liver. Paired with ginger and oranges this juice is not only bursting with flavor, but also with a hefty dose of vitamin C, folate and healing anti-inflammatory properties that can help reduce soreness. I like to think of it as a delicious multivitamin, without any synthetic vitamins or fillers! Blend until smooth and enjoy this tasty treat! Garnish with a sprinkle of oatmeal and coconut flakes! Blend, pour, sip and enjoy! I'm no body builder but I feel like one when I drink a good old fashioned protein shake. Sometimes those busy mornings call for a quick breakfast that you can take on-the-go. Don't worry if you don't have one of those protein shakers - I threw the ingredients in a martini shaker with ice and it worked great ; ) If you really want to feel like a bartender throw in some Baileys or Kahlua...on a Saturday of course! Shake, pour and serve over ice. 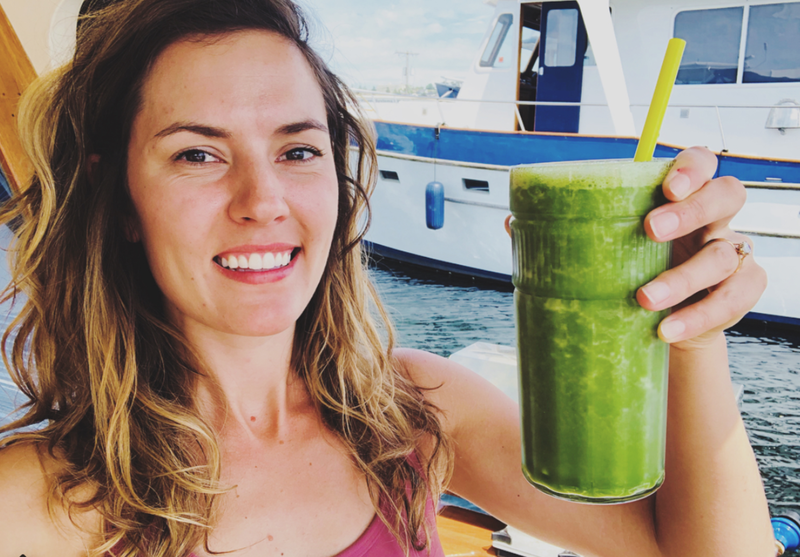 I randomly added a few fresh mint leaves as a garnish to this smoothie and loved the essence it gave while sipping on this refreshing smoothie! This smoothie is packed with lots antioxidants (see what all the hype is about with antioxidants here), fiber and omega 3 fatty acids. Blend until smooth, sip & enjoy! Crazy for Coconuts? You Have to Try This Creamy Coconut Deliciousness! I know it's not quite spring in Seattle but this smoothie makes me feel like I'm on a beach in Hawaii sippin' on a healthy piña colada! Enjoy this tasty treat to re-fuel post workout and as an easy grab-n-go breakfast! Blend until creamy and smooth. Enjoy! Blend until smooth and garnish with a pinch of cocoa powder!